All kids need vitamins, minerals, and other nutrients to be healthy and grow normally. If you kids don't eat these kinds of fish, they could need another source of omega-3 fatty acids, including other foods supplemented with fish oil, a multivitamin with DHA and EPA, or other fish oil supplements. Nutrition fads seem to come and go, even in child nutrition. Iron used to be big among vitamins and minerals, and parents would always try to get kids to eat their spinach. As more foods became supplemented with iron, parents seemed to shift their focus to vitamin C.
Fish oil may be the new nutrition fad, even though most parents should likely focus on calcium and vitamin D since many kids don't drink enough milk. Why is fish oil popular? Is it because fish oil is high in polyunsaturated fatty acids, which are thought to lower triglyceride levels? Or because fish oil benefits include that it may reduce the risk of coronary heart disease and slightly reduce high blood pressure? Other fish oil benefits that may have made it popular include claims to help ADHD, asthma, arthritis, abnormal heart rhythms, and that it may help prevent some types of cancer. The claims that it may help promote brain development is likely the fish oil benefit that most parents focus on though, and which makes fish oil so popular. Unfortunately, there are many conflicting studies about fish oil benefits, and not all studies have even shown that they have any benefit at all. Other DHA-fortified foods (check food labels), including Horizon Organic Milk Plus DHA Omega-3, PediaSure, Sara Lee Soft & Smooth Plus 100% Whole Wheat Bread, Silk Wellness Soy Milk (Silk DHA Omega-3 & Calcium), and Mission Life Balance Flour Tortillas, etc. Most of these foods that are fortified with DHA use algae, a vegetarian source of DHA. If they simply say that they have naturally occurring omega-3 fatty acids, then they likely have small amounts of ALA, and not DHA and EPA. Keep in mind that although DHA-fortified foods have much less DHA than most fish, your kids will likely eat and drink them more often and with other DHA-fortified foods. For example one cup of Silk Wellness Soy Milk only has 32mg of DHA and EPA vs. the 330mg in albacore tuna or over 3000mg in salmon, but kids can only eat limited amounts of fish, while he might drink two or three cups of DHA-fortified milk each day, in addition to other foods with DHA and EPA. The American Heart Association recommends that all adults eat a variety of fish, preferably those high in omega-3 fatty acids, at least twice a week, and also eat foods rich in ALA, such as flaxseeds, walnuts, soybeans, tofu, and flaxseed, canola and soybean oils. Adults with coronary heart disease should make sure they get at least 1000mg each day and even higher doses if they have high triglyceride levels . The usual fish oil dosage for kids, if they are getting their fish oil from actually eating fish, is two servings a week. There isn't a more specific mg per day recommendation for DHA and ARA for kids yet. When serving fish to kids, parents should keep all fish and mercury warnings in mind, including that they limit canned albacore tuna to no more than once a week. Young kids can eat other fish that are lower in mercury, such as canned light tuna, salmon, pollock, and catfish, twice a week. And remember that women who may become pregnant, pregnant women, nursing mothers, and young children should not eat any shark, swordfish, king mackerel, or tilefish at all since they can have high levels of mercury. Since many of the foods that are high in omega-3 fatty acids, especially those derived from fish oil, are not exactly kid-friendly foods, and there are still only limited numbers of DHA-fortified foods, you may need to give your child a fish oil supplement if you want to make sure they get enough of these omega-3 fatty acids. Although normal doses of fish oil are not thought to be harmful, giving kids fish oil supplements is a little controversial, as not all studies have shown that they have any benefit. Keep in mind that amount of omega-3 fatty acids in these vitamins can vary greatly. Some multivitamins with DHA actually have very little DHA in them, often as little as 100mcg or 0.1mg per dose. Other fish oil supplements, like the Coromega Kids DHA Gummy Fruits, have 50mg of DHA plus 10mg of EPA per serving (2 gummies). Check the label to make sure you are getting the amount of DHA you are expecting. 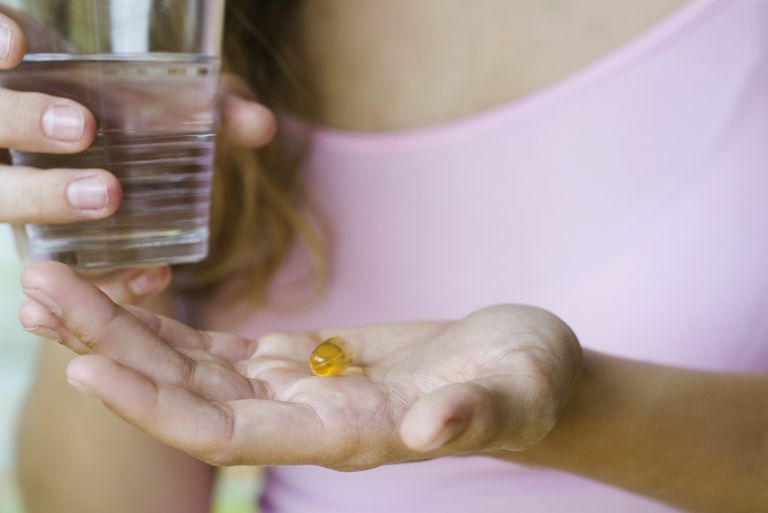 There is a lot to think about when considering fish oil and fish oil supplements. DHA, ALA, foods fortified with DHA derived from algae, and the risks of mercury in fish are just some of the things to make sure you understand. There are no % daily values for DHA, EPA, or ALA, even if you see them on some food labels or supplements. Omega-3 fatty acids are essential fatty acids, meaning that our bodies can not produce them on their own and need to get them from our diet, either from the foods we eat and drink or from a supplement. An increase chance of bleeding and problems with clotting can be side effects of high doses of fish oil (more than 3000mg of DHA plus EPA each day for adults). Although the source of omega-3 fatty acids likely isn't that important, do make sure that your fish oil supplement or omega-3 supplement contains both DHA and EPA if you want the possible benefits of fish oil. Fish, algae, or fish oil are all good sources of these omega-3 fatty acids. The fishy taste of some fish oil supplements is often covered with sugar or artificial sweeteners. Do not give your kids fish oil supplements if they are allergic to fish or shellfish. There are some concerns that some fish oil supplements can be contaminated with polychlorinated biphenyls (PCBs) or mercury, which is especially concerning since the FDA does not actually have to approve supplements to make sure they are safe or effective. Buying supplements that state they are USP (United States Pharmacopeia) certified can help to make sure they meet quality, purity, and potency. Unfortunately, few supplement makers actually participate in the USP program. American Academy of Pediatrics. Clinical Report. Prevention of Rickets and Vitamin D Deficiency in Infants, Children, and Adolescents. Pediatrics 2008 122: 1142-1152. American Academy of Pediatrics. Where We Stand: Vitamins. Updated June 2010. American Heart Association Scientific Statement. Fish Consumption, Fish Oil, Omega-3 Fatty Acids, and Cardiovascular Disease. Circulation. 2002;106:2747-2757. Center for Science in the Public Interest. Omega-3 Madness: Fish Oil or Snake Oil. Sethuraman, Usha MD. Vitamins. Pediatrics in Review. 2006;27:44-55.